GRAND RAPIDS, Minn. — Minnesota hunters and trappers killed 17 wolves over the weekend, which marked the start of the second half of the state's first managed wolf season. During the earlier part of the season, hunters killed 147 wolves. The late season runs through the end of January, but the DNR will shut it down early if hunters and trappers reach an overall limit of 400 wolves. In north-central Minnesota over the weekend, 16-year-old Koltin Wagner was among nearly 800 Minnesota trappers who are the first to legally trap wolves since the early 1970s. Read complete article / listen to audio. Minnesotans hoping that a newly elected DFL-controlled Legislature might rethink the state's controversial wolf hunt may be disappointed. The hunt received bipartisan support earlier this year, and DFL backers will hold key leadership posts. Rather than being partisan, views about the hunt reflect Minnesota's cultural divisions -- among hunters who kill wolves for sport; those opposed to hunting animals not used for food; landowners losing livestock to wolves; Ojibwe bands, for whom the gray wolf is sacred; people opposed to a hunt so soon after the delisting, and those opposed to hunting of any kind. All voices deserve to be heard. Unfortunately, as soon as the wolf was removed from federal protection under the Endangered Species Act in January, lawmakers quickly introduced bills allowing for this year's hunt. Their rush minimized opportunities for Minnesotans to comment in meaningful ways. Read complete editorial. The crowd fighting the chilly winds of Lake Superior marched through downtown Duluth, Minnesota to protest the beginning of a controversial wolf-hunting season. Robert DesJarlait carried the Cherish the Children Eagle Staff as he and Niibiwi Misko Makwa lead several hundred supporters for Wolf Walk 2012. Designed like a shepherd's staff, the Eagle Staff is a powerful symbol, representing the stature and honor of a tribe. 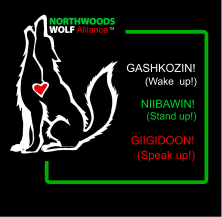 The honor of the Anishinaabe called them to come to the aid of their brother, the wolf. Nearly 100 wolf advocates rallied on the Iron Range to call for an end to hunting trapping and snaring wolves. The rally took place in the Thunderbird Mall parking lot in Virginia and was organized by the Northwoods Wolf Alliance and Howling for Wolves. Many protestors held signs that that read: real hunters don't kill wolves. Those at the rally listened to guest speakers and discussed concerns of people living in close proximity to viable wolf populations. Organizers say the event helped to shine light on a wolf pelt trade currently taking place. They say hunters are selling pelts overseas to Asia for about $500. Minnesota's late-season hunting and trapping period opened Nov. 24 and will continue until Jan. 31 or until harvest targets are reached. DNR staff disclose hunters and trappers are primary clients and livestock owners are secondary clients. Email from Dennis E. Simon, Chief, Wildlife Management Section, Division of Fish and Wildlife, MN Dept. of Natural Resources to Kathy A. DonCarlos (also DNR).